Anyone know if this ever came out? Found Malgré la nuit to be an incredible experience and would love to be able to rewatch it. My Amazon pre-order got cancelled. Hope it does make it out eventually though, even though it's a shame it's DVD only. Here's to hoping they've changed their minds and plan to release it as Blu-ray! Shellac Sud's website is currently broke to boot. The box has been pushed to the spring, still coming out. The Shellac-Sud website still doesn't list the set, nor indicate if a blu-ray version will be available. If anyone knows if it will be available on blu-ray, I'd love to know. Thanks. The release of the set has been pushed back to the spring (no exact date at this time). The set will consist of DVDs. No blu-ray. For those who read French: "le coffret est repoussé au printemps, nous n'avons pas encore de dates précises. Le coffret sera composés de dvd, pas de bluray." Does anyone have any updates on the status of this set? The French Amazon link from the previous post indicates (according to Google translate) that the set is currently unavailable and it's not clear if/when it will be back in stock. Was this ever even released? There's almost no mention of it on the internet aside from this thread and the link above. I'm a big fan of Grandrieux after seeing Sombre and La Vie Nouvelle, easily two of the most terrifying, formally inventive films I've seen. He's obviously a very challenging filmmaker, but I'm still a bit puzzled about just how difficult it is to obtain copies of his films. There's currently an oversaturated market for Blu-Rays and dvds in which previously obscure films have been rescued from obscurity, so why is Grandrieux so consistently ignored? None of his films have been released on Blu-Ray at all, and only Sombre got a US release (dvd only). None of his non-narrative films have received dvd distribution (to my knowledge). 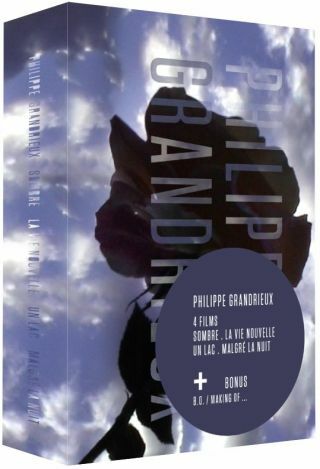 I just saw that there's a new book Sonic Cinema about Grandrieux's work, which I will be getting soon. Hopefully that will help spread the word about him.